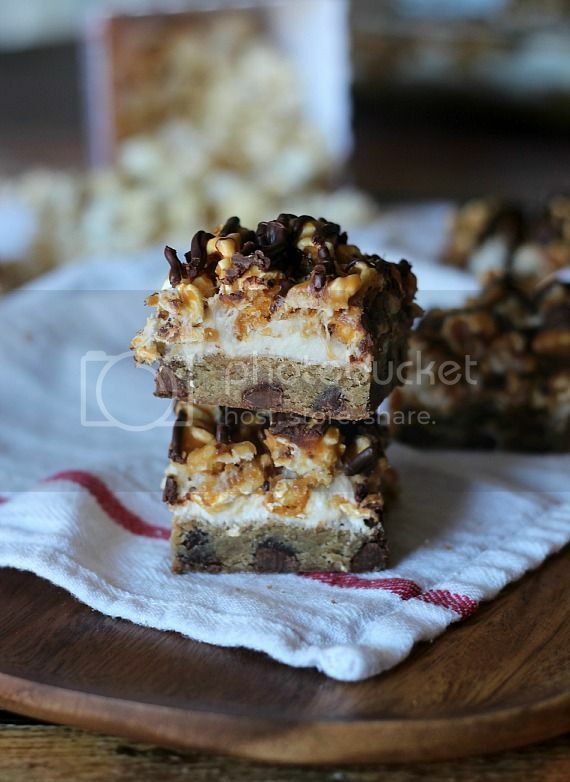 I know you’re thinking it’s weird to put popcorn on top of a cookie bar. Sometimes you have to trust me, which I know it totally a sketchy thing to do…trust some random lady on the internet who is trying to fill you full of calories and nonsense. But stick with me just a second. These bars are no eagle swooping down and snatching a baby. They are the reallll deallll. 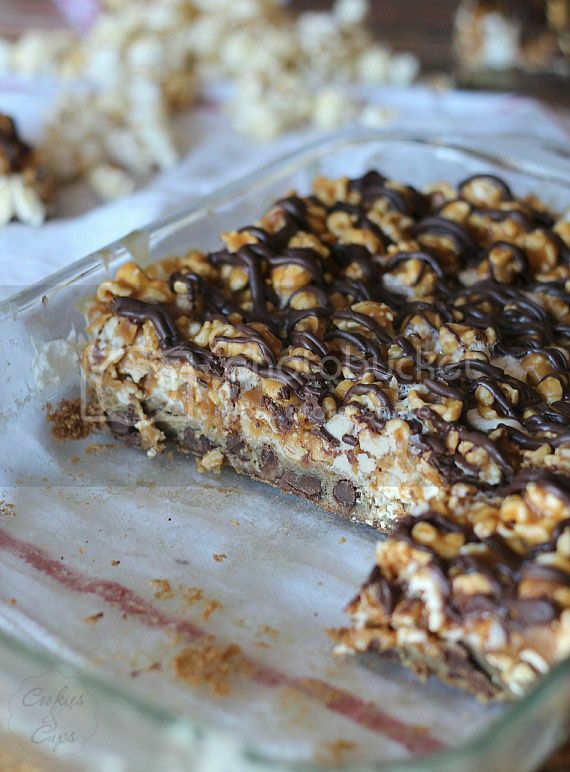 Chocolate Chip and Peanut Butter Popcorn Bars. There are a few steps to these, yes, but it’s worth it..and trust me, nothing is complicated. Anyhow, the webinar also included some fun panelists…girls I totally adore…Julie from The Little Kitchen, Sommer from A Spicy Perspective, Maria from Two Peas and Their Pod and Brenda from A Farmgirls Dabbles. The panelists, along with Ree, each introduced a food trend for 2013. And well, since Maria and I are long lost soul mates, she chose popcorn. She speaks to my soul. I decided to jump on the popcorn bandwagon and spin it in a different direction. That’s how these bars came to life. Whip up some cookie dough and bake it for 15 minutes. Meanwhile grab a bag of popcorn, or pop your own. 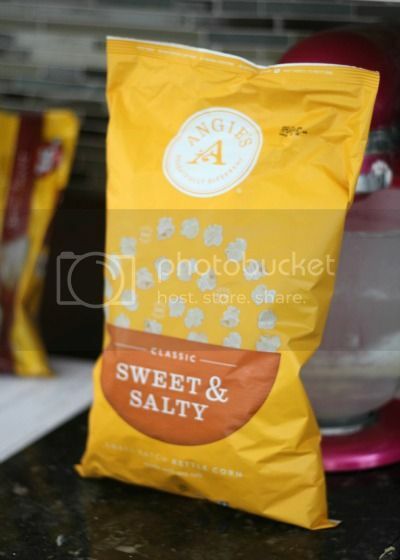 I opted for my new addiction, this Sweet and Salty Kettle Corn from a brand called Angie’s. I am literally obsessed with this stuff. Ob. Sessed. Next up, melt some butter, peanut butter and corn syrup together and coat a few cups of popcorn. Set that aside. When the cookie is done, take it out and sprinkle it with mini marshmallows. Pop that back in the oven for just a few minutes until the marshmallows puff up. Then immediately spread the coated popcorn evenly all over the warm marshmallows, pressing them lightly to stick. I drizzled some melted chocolate all over that and let it cool completely. It actually took a few hours to cool down until I could cut it. Then dive in. Mouth first. Turn mixer to low and add in eggs and vanilla. Turn mixer back up to medium until evenly incorporated. Turn mixer back down to low and add in baking soda, salt and flour. Mix until just combined. 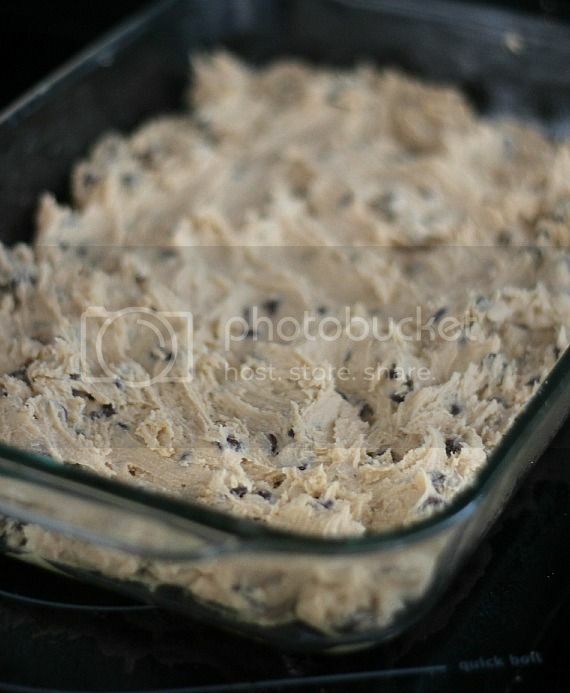 Press dough evenly into prepared pan and bake for 15 minutes or until edges are golden. While cookie is baking, mix corn syrup, butter and peanut butter in a large saucepan over medium heat. Stir until smooth and mixture is heated through. 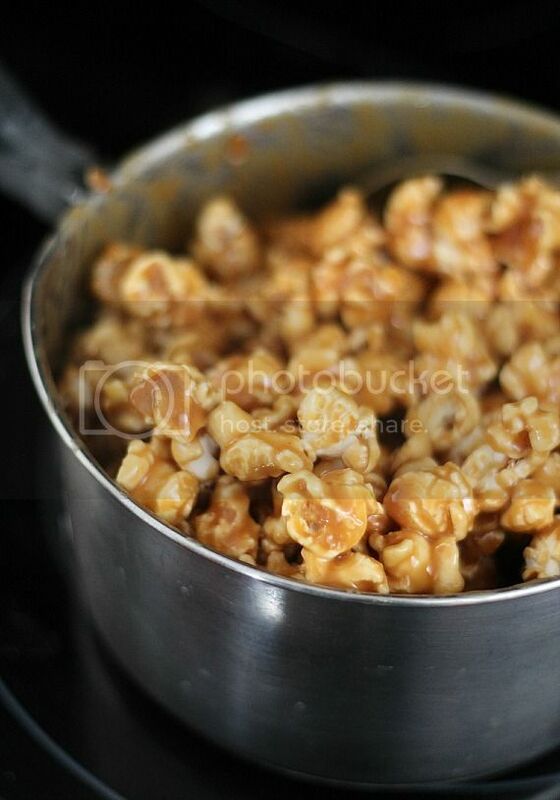 Remove from heat and stir in popcorn, coating it completely and evenly. Set aside. 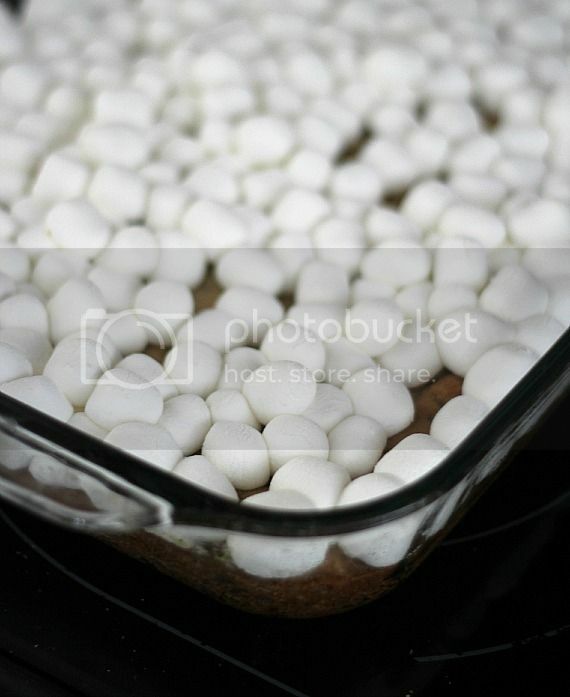 When cookie is done baking, remove from oven and immediately sprinkle marshmallows evenly on top. Place back in oven for 2-3 minutes until marshmallows are puffed, but not browned. I mean- this looks insanely good. I think popcorn and cookie bars together make perfect sense!! I must try these…..thank you so much! Whoa these look beyond amazing! Popcorn, marshmallows and cookies?! Pure heaven. These are insane. Absolutely insane. 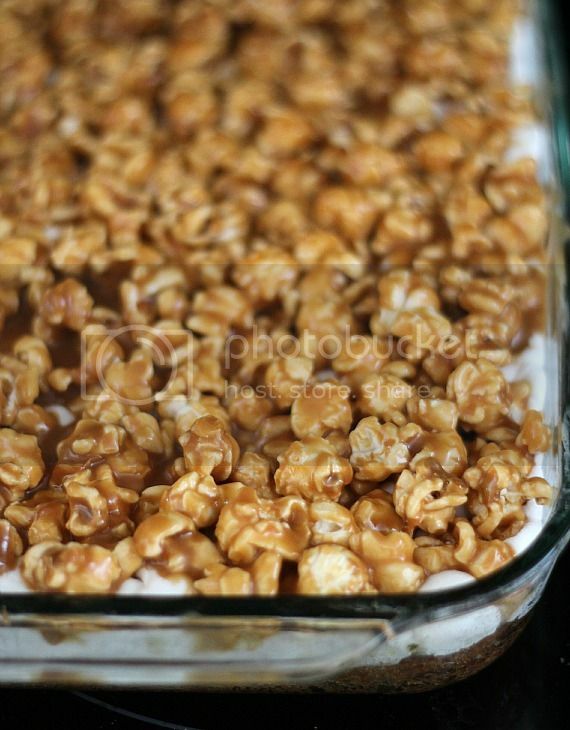 I love caramel corn and can only imagine how awesome it is with all the other layers. This reminds me of the zebra popcorn samples from Costco–I may or may not have gone back (not quite incognito) 10 times for more. I will go out and purchase a bag of popcorn so I can make this! Thanks Dorothy! Oh gosh, I don’t even know what I was thinking! I must’ve had my Crazy for Crust tab open when I typed this 🙂 sorry Shelly! no problem, I was like huh? when I read it! I honestly haven’t seen something THAT good in a long time! I can’t wait to try this. I’m totally with you on putting popcorn on top of bars. I’m all for popcorn everywhere! Their look is so tasty. Thanks for your recipe. I like to try this at next weekend. I think my husband be an interest for this food. These look absolutely amazing. Caramel corn and marshmallow? WInning!! Wow, these bars cover just about everything! Another winning combination, Shelly! I saw popcorn and I was like WHAT? We are popcorn fanatics in our house, so this totally rocks! I can not wait to try this recipe!!! Cookies, marshmallows, popcorn and chocolate! What’s not to love?! After tasting Smitten Kitchen’s popcorn cookies I am SO behind popcorn in baked goods! And I’m so excited for popcorn being a food trend in 2013. Bring.it.On. I’m dying over these. That’s my favorite brand of kettle corn and caramel corn! Ever since they changed the packaging, I’ve been able to find them in more and more stores! And when some companies do the Christmas kettle corn, drizzled in peanut butter, I die. So, yes, I want these. Very badly. These are getting made as soon as possible! How fun are these bars! Popcorn and cookies are like the 2 best snacks, so why not mix them! These look absolutely delicious! I can feel the popcorn crunch in my mouth already. Around the holidays last year I discovered Kettle Corn Cookies at Trader Joe’s. I was smitten from the first bite. I will not admit to shamelessly eating every last crumb from the container ???? These would be a winner at my li’l one’s birthday! Cookie, marshmallow AND popcorn…oh my! I’m so in love with this right now! This recipe looks SOOOO delicious! I can just imagine the different textures & flavors coming together perfectly! Wow! This sounds like such a delicious blend. I can taste it already. Oh my word! The salty, the sweet, the crunchy, the chewy — this recipe has got it all! I can always count on you to stick deliciously decadent deserts together in new and creative(ly insane) ways. Wow! Yes to all three layers – they look meant to be together all on one bar! How did you come up with these? Can’t wait to try them myself! I’ve been dreaming of these ever since I saw that photo on Instagram. I’m glad popcorn is a new trend, because it’s been trending at my house for years now! This recipe is TOTALLY happening. The sooner the better! Oh, are you KIDDING me with these?!?!? Popcorn ON cookies? I’m in love. First of all, these look ah-maze-ing! I wonder if I could skip the peanut butter process and just use the carmel corn that’s in my pantry. Do you think the bars would be dry? Thanks for recipe, I must try this in my home. These look fantastic! And thanks for sharing that eagle video. It had my husband and I both laughing. And also a little horrified. I was wondering if these bars free well? I wouldn’t recommend freezing these, as the popcorn would get very chewy and most likely shrivel up. OMG, so good! I brought a few to work and they were all gone within 5 minutes. Thank you for recipe; I’m adding it to my favourites.